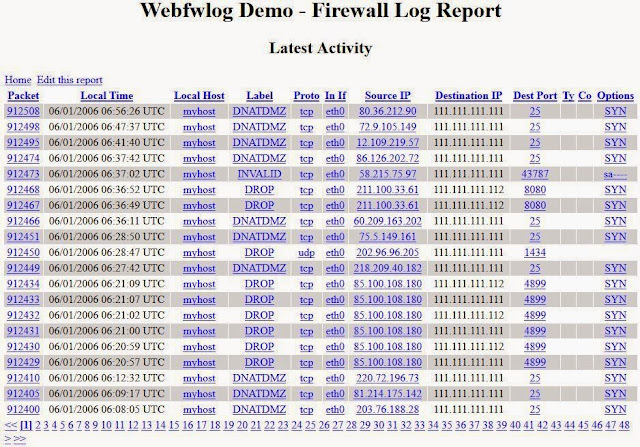 Webfwlog is a flexible web-based firewall log analyzer and reporting tool. It supports standard system logs for linux, FreeBSD, OpenBSD, NetBSD, Solaris, Irix, OS X, etc. as well as Windows XP®. Supported log file formats are netfilter, ipfilter, ipfw, ipchains and Windows XP®. Webfwlog also supports logs saved in a database using the ULOG or NFLOG targets of the linux netfilter project, or any other database logs mapped with a view to the ulogd schema. Versions 1 and 2 of ulogd database schemas are supported. Webfwlog fully supports IPv6 for database logs, and netfilter and ipfilter system logs. With Webfwlog you can design reports to use on your logged data in whatever configuration you desire. Included are example reports as a starting point. You can sort a report with a single click, "drill-down" on the reports all the way to the packet level, and save your reports for later use. You can also create a link directly to any saved report. - Your favorite web browser. Windows XP® support provided via Cygwin.